Traveling can prove stressful to animals, so don’t catch your pet off-guard. Before leaving town, practice taking short rides in the car or spending time in a carrier. This will help your pet get used to the experience. If you haven’t already micro-chipped your pet, this may be a good opportunity to do so. This is also the time to ensure your pet’s collar is up-to-date with your current contact information. Pet medication refills away from home could be difficult. To alleviate anxiety, bring along pet blankets and toys as reminders of home. Also pack a pet-specific first aid kit, which should include non-stick bandages, adhesive bandages, towels, gauze and your veterinarian’s phone number. Do your research to ensure you’re following rules along the way and at your destination. Check airline policies, as well as hotel and campsite restrictions and accommodations. Travel across state or international borders requires a health certificate. Some locations require more information and documentation. Give yourself plenty of time to handle these details. Your veterinarian can be a good resource in learning what to expect. To that end, a check-up is also a good idea before a trip, as vaccinations or preventive medications may be needed before traveling. While seatbelts alone can keep a dog from moving about the cabin of the car, they are not your safest option. To help protect pets in a crash, anchor a crate using a seatbelt or other secure means. When flying, opt to keep your pet in the cabin of the plane if possible. Temperatures and air quality in cargo can put a strain on pets. If your animal is too large to fly in the cabin, speak to your veterinarian about what you can do to keep your pet safe and relaxed in-flight. Even the best laid plans can hit snags. Be prepared for the possibility that your pet will become accidentally injured or develop an unexpected illness while traveling, prompting an unplanned trip to the vet. To prepare, consider solutions like the CareCredit credit card, issued by Synchrony Bank, which features special financing options (subject to credit approval) that can allow you to focus on getting your pet better while making monthly payments. More than 200,000 health care providers and health-focused retailers, including over 20,000 veterinarians accept the CareCredit credit card nationwide, which also sponsored the distribution of the tips in this article. Go to www.carecredit.com for pet healthcare providers closest to your vacation destination. Photo courtesy alexei_tm / stock.Adobe.com Advance planning is key when traveling with a pet. With a little care, you can make your travels with furry friends safe, fun and memorable. 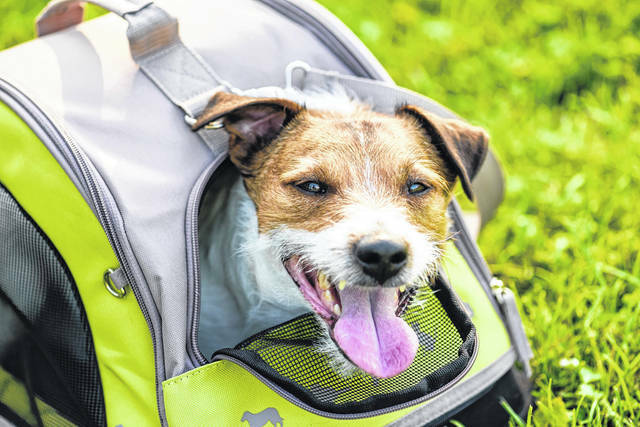 https://www.galioninquirer.com/wp-content/uploads/sites/38/2018/07/web1_Traveling-with-Pets.jpgPhoto courtesy alexei_tm / stock.Adobe.com Advance planning is key when traveling with a pet. With a little care, you can make your travels with furry friends safe, fun and memorable.